The Honda Ridgeline offers all the capabilities consumers expect from a pickup truck, but as it bears a Honda badge and shares some of its underpinnings with the Pilot crossover and Odyssey minivan, some have understandable apprehensions about what it can really do. 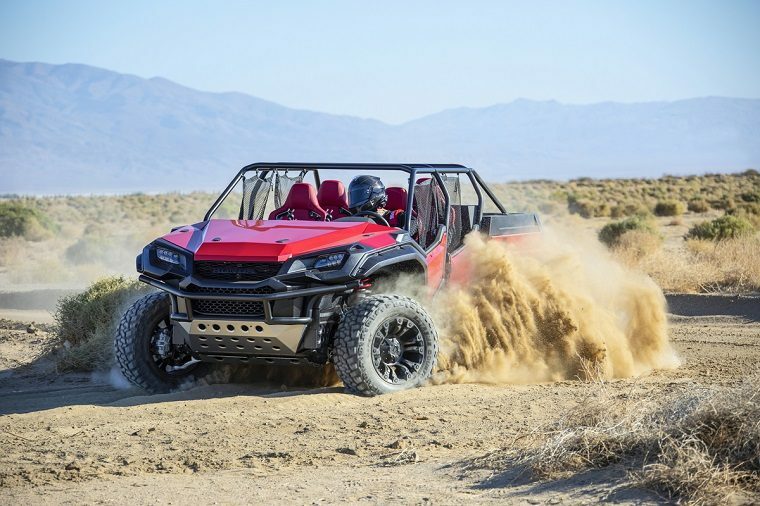 To put that unease to rest, the Japanese automaker arrived at this year’s SEMA Show in Las Vegas with what it calls the Honda Rugged Open Air Vehicle, or ROAV, essentially a plus-size version of the Ridgeline crossed the Pioneer 1000 ATV. Though it looks a lot like the ATV — in fact, the doors are straight off of it — the parts that matter are all Ridgeline. It uses the same stock suspension as the pickup truck, and Honda didn’t mention any mechanical changes, so it’s likely the engine is the same as well: a 3.5-liter V6 paired with a six-speed automatic, rated at 280 horsepower and 262 lb-ft of torque. The interior is also a mix of Ridgeline and ATV-inspired elements. The dashboard is from the Ridgeline, the steering wheel from the Pioneer, and the Civic Type R provided the seats, though not they were first covered in waterproof material. The dashboard was also given a special coating for the same purpose, a smart choice given that the Honda Rugged Open Air Vehicle and its occupants are completely exposed to the elements. There’s very little chance Honda will ever actually sell a vehicle like this, but it serves as a good example of what the Ridgeline is all about. And of course, it’s just plain cool. But that’s SEMA for you.